Jolly King is a clear leader when it comes to economical, sulfur-free plasteline. Offering all the benefits of more costly modeling materials, this wax-based plasteline provides a smoother, more uniform texture enjoyed by professional sculptors. See individual products below for available unit weights. 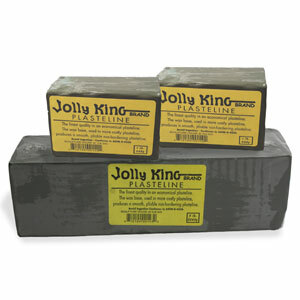 Jolly King Plastilina - Non-Sulfur - Grey-Green - 1-lb. Jolly King Plasteline - Grey-Green - Case - 48 lbs. Jolly King Plasteline - Grey-Green - 5 lbs. Jolly King - Grey-Green - 5 lbs.